May appear to be a horsey film but it’s also an underrated coming of age movie. International Velvet (1978) is a girl loves horses picture from the 1970s. I’m reviewing it as it’s a personal family favourite, and has continued to be so more or less since then. It’s also a definite weegiemidget weeper and I’m not normally a fan of horsey films. I first watched it with my then (and still) horse obsessed little – but now considerably taller – sister and I’m glad she was as otherwise I would have missed out on this British gem. The film’s musical soundtrack is both haunting and mesmerising and was written by Francis Lai. If you want to see the prequel, the film you are looking out for is National Velvet (1944). It stars a very young, Elizabeth Taylor as Velvet and Mickey Rooney. This film tells the story of Velvet Brown, who in the first film was an English adolescent girl and Grand National entrant whose win was invalidated as she was deemed too young. International Velvet continues the story – but can equally be viewed as a stand alone film – introduces us to Velvet’s equally horse obsessed orphaned niece from Arizona, Sarah. The story tells of how Sarah first comes to live with her British aunt and her boyfriend and relates events in Sarah’s life from the age of 10 to 18 years and is played by Tatum throughout. It also tells how the Pie, Velvet’s winning horse has sired a foal and Sarah wants to buy him. Unfortunately she is pipped to the post, leading to her aunt buying him and her joy in this led to much sobbing, when Sarah find out and screams “It’s the foal. It’s the foal.” This line is mimicked every time my sister and I watch this as part of the viewing and at one time was impersonated even more than certain Ewings, but that story and the rest of International Velvet‘s story is for another day.. but I will say there’s even little romance for you for the hopeless romantics amongst you. Velvet’s boyfriend is played by Christopher Plummer – Andrews’ co star in the hit movie musical The Sound of Music (1965) – there told you it was weird. It would feel a bit like some people do after watching Titanic (1997) then Revolutionary Road (2008) and seeing Leonardo Di Caprio and Kate Winslet playing lovers in the former and then warring lovers in the latter. If you saw Andrews and Plummer in both films, and watch them chronologically – and the first one you inevitably had to watch at least 3 times, with both sets of grandparents you would half expect Andrews and Plummer to start singing in the next movie – so we should be thankful Andrews didn’t take the part and Forbes cast his wife instead. So all is forgiven Nanette. Anyway back to Christopher Plummer, His character John Seaton, as Velvet’s live in boyfriend, is such a likeable character you could just hug him as he comes over as such a lovely guy. There is something about Plummer that women and girls of a certain age find attractive. Even his screen eldest daughter, in the Sound of Music, Charmian Carr – who played Liesl – has since then confessed an off set crush on him. Must have been the way he blew his whistle. There’s also an Oscar-winner to look out for – which is given away in the trailer – and of course lots and lots of horses. And it was a nice surprise seeing him when I watched the film again as I had forgotten he was in it. And International Velvet has to be one of the better sequels, right up there with the Star Wars ones. So if this is on the Christmas telly this year, I totally recommend the film if you want to see a young, Christopher Plummer or horsey film whichever floats your boat. But either way those of a sensitive nature – like myself – keep the tissues handy. 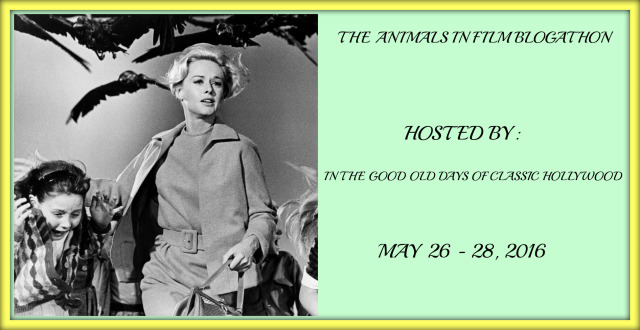 This post was added to “The Animals in Film Blogathon” run by the Good Old Days of Classic Hollywood as found HERE. More about this film can be found in a further post about 5 Child Actors. More reviews here with its star Christopher Plummer include Star Trek VI: The Voyage Home, Starcrash, The Lake House and The Sound of Music. Thanks for participating in the blogathon and sending in this great post. I have never seen “International Velvet”, but now it’s got me intrigued. I may need to treat myself to my first viewing. I’ve also just announced another blogathon, and would love to invite you to participate. The link is below with more details. Sure no problems. Let me know. Hi, can you put me down for the Man from Uncle Film The Karate Killers?? Sure. Looking forward to it. Thanks for joining in. Remember to keep your tissues handy! Oh my gosh, I feel like I’ve let my childhood self down by having not seen this movie! I was just talking to the kids about the original one last night with Elizabeth Taylor so I feel a Velvet viewing party coming on!